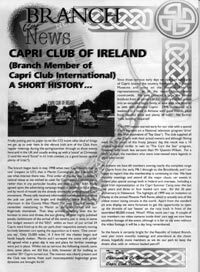 The Capri Club of Ireland was formed in April 1998 and since then it has grown steadily and now has members from every corner of Ireland. The aim of the Club is to get people together who either own or just have an interest in the Ford Capri. The Club also aims to help owners source that hard to find part that eludes us all from time to time. The Club has regular meetings in the summer months and attends all the major car shows throughout the year. Also the Club prints a members newsletter every month during the summer and bi-monthly in the winter. This newsletter gives members a chance to hear about other members stories relating to the Ford Capri and it also has interesting articles, show reports up-coming event information and the odd car of part for sale. Club members can also avail of a classic car insurance policy with Carole Nash Insurance Company. Above all the aim of the Club is to enable us all to keep our beloved Capri’s in as good condition as possible as well as enjoying the driving experience associated with the Ford Capri. The Club currently has a subscribed membership totaling 108 members, and overall a total of one hundred and eighty six people have taken membership throughout the Club's five and a half year history. Considering the small population of Ireland (approx 4 million), plus the fact that we only represent the southern counties as the Northern Ireland Branch of Capri Club International cover the rest of Ireland with many members, this only proves how popular the Ford Capri has been and still is in this country. Finally putting pen to paper to let the CCI know what kind of things we get up to over here in the vibrant Irish arm of the Club, from regular meetings during the spring and summer through to show events here and in the UK and usually ending up with a "social" at Christmas (I use the word "social" in it's Irish context, i.e. a good booze-up and plenty of "craic"!). The branch began back in May 1998 when two "Capri hearts met as one" (respect to U2! ), that is Martin Cunningham and I decided to see what interest there was. First order of the day was to select a central venue as we wished to cater for Capri owners' countrywide rather than in any particular locality, and then a date. Both finally agreed upon, the advertising campaign began in earnest, in local press and by word of mouth via the already simmering underground Capri movement. Phone calls received, information exchanged and then to the pub car park one bright and thankfully sunny May Sunday afternoon in County West Meath. "I'm sure they will come", I remember mentioning to Martin as the clock ticked and our fingernails shortened. And then they arrived, speeding over the far horizon in twos and threes, the sun glinting off their highly polished panels, reminiscent of the arrival of the cavalry, just in time, in some low budget western of the '50s!! Within an hour of our arrival 24 Capris were lined up in the car park, their respective owners moving furtively between cars eyeing the opposition as it were. "One owner you say", "Only 25,000 miles", "A 3 litre V6" the chatter began and hands happily shaken. Martin and I surveyed the scene with pride! All agreed what a great day it was and plans for further meetings were put in place. Whilst not as nervous the following month, same time, same place, we did fret a little, however all for nothing as another 20+ Capris turned out. The interest was clearly present and the Club was borne, from such inconsequential beginning great dynasties are brought forth! Since those nervous early days we have had cavalcades of Capris touring the country, from visits to Transport Museums and tours on the Shannon River to representations at all the major classic car events countrywide. We have gathered a large like minded brethren from all corners of the country that has grown into an extended happy family, as at ease with one another as with their beloved Capris'. 1998 culminated in a weekend in a hotel in Athlone with good friends, good food, plentiful drink and plenty of "craic". No further "male bonding" required! The 1999 season started early for our Club with a special Capri segment on a National Television program "Drive" (the Irish equivalent of "Top Gear"). The Club supplied all the Capris with their proud owners and although filming went on for much of the frosty January day, the result was a 10 minute segment similar in vein to "The Cars' the Star" program, however with much less sarcasm than Mr Quentin Wilson. For a while a least, the members who were interviewed were legends in their own minds! At present we have almost 60 members owning nearly the complete range of Capris from the early Mark I through to the Brooklands, and I am happy to report that the membership is continuing to rise. We have monthly meetings and attend all the major classic car events in Ireland plus special outings both in Ireland and overseas including a good Irish representation at the Capri Summer Camp over the last two years and three or four loaded cars over for the 30 year anniversary in Halewood. The highlight of 1999 was an invitation to display at the annual Phoenix Park Races, which is actually one of the oldest motor racing circuits in the world. Apart from the standard Pit Area display, we were fortunate to get the opportunity to open up the throttles of our "beasts" on the race track in front of the assembled 80,000 crowd. Wow!! What more can I say. A couple of our members ran video cameras inside their cars and we now have excellent footage of the event, although it is fair to say even without the video footage it will be a day long remembered. So the future is certainly looking bright for the Republic of Ireland branch, next year more monthly meetings and attendance at the classic shows, hopefully more members as we do our part to keep the dream alive, with or without leaded petrol!! You can find the club online on their Facebook page here.